Sue Lloyd who played the role of Jean Courtney in both The Ipcress File and in a small cameo in Bullet to Beijing passed away on 20 October 2011, aged 72. Lloyd made an initial splash in the 1960s as Michael Caine's glamorous foil in 'The Ipcress File' as well as appearing alongside Peter Cushing in the horror film 'Corruption' in 1968. At the height of her 60s fame she sold stories about affairs with the likes of Sean Connery and Peter Sellers, the subsequent money enabling her to buy a London flat. However, she is remembered far more fondly for her role as Barbara Hunter in the long running soap 'Crossroads,' a character who appeared in 714 episodes before leaving with on-screen and future real-life husband Ronald Allen in 1985. Sue wrote her own biography "It Seemed Like a Good Idea at the Time" in 1998. Here's Michael Caine's first interview for American television, filmed during the summer of 1965 outside of his home in London. Michael Caine and Merv Griffin talk about his new movie the IPCRESS File, shot on 16 August 1965. 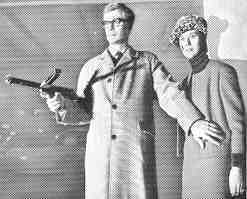 Listen to The Ipcress File radiocommercials (1965!). You need Real Audioplayer or VLC. 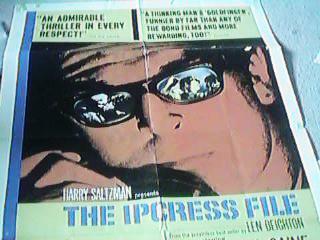 For three editorials about The Ipcress File, especially written for newspapers click here. 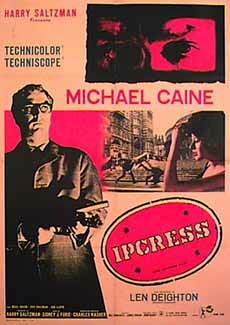 Pressarticles about The Ipcress File: click here . For a special advertisement containing review 'quotes' click here. A special essay about The Ipcress File in relation to other spymovies. 'Spies and secret agents', written by Vanessa Mehrabian, a Film Studies student. Click here to read the essay. Published exclusively on this site with permission of the author. Special packaging incorporating stylish slip case. Introductory booklet written by journalist Christopher Bray, author of "Caine: A Class Act". Commentary with director Sidney Furie and film editor Peter Hunt. 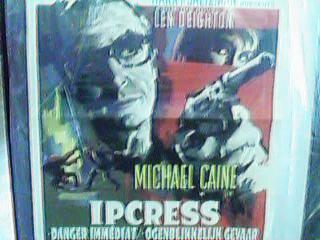 "The Ipcress File - Caine Goes Stella" spoof introduction with Phil Cornwell as Michael Caine. 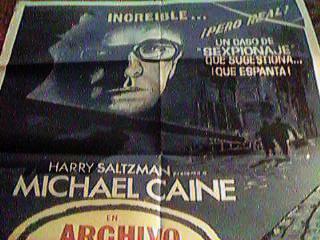 Sixties documentary "Candid Caine", featuring Sir Michael Caine talking frankly about his career in 1969. New exclusive interview with Sir Michael Caine about making The Ipcress File. New exclusive interview with legendary Oscar-winning production designer Sir Ken Adam about making The Ipcress File. Separate soundtrack CD with music by composer John Barry OBE. A copy of the original Len Deighton novel. Stills gallery (slide show, more than 13 min.). 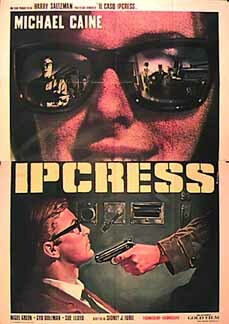 A3 dual sided Ipcress File movie poster designs. For other dvdreleases and dvdcovers click here. 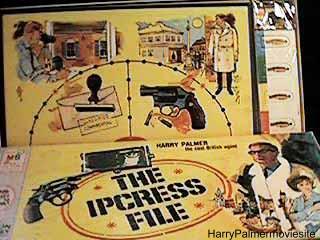 In 1965 The Ipcress File was such a hit, that MB Games decided to put a game on the market. This kind of merchandise was very successful with the James Bond movies, so MB developed a special game for the first Harry Palmer movie. The object was to find the double agent. See also pictures. 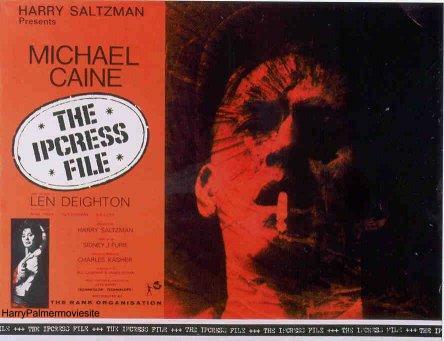 For information about the soundtrack of The Ipcress File go to Soundtracks. 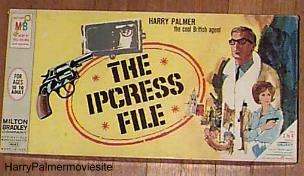 For trivia and other strange stuff about The Ipcress File go to the Trivia page ! 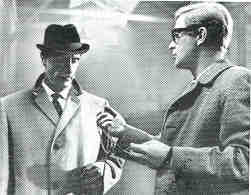 For scenes that never made the final version of The Ipcress File go to Deleted Scenes. To see where all the scenes were shot, including 'then and now' shots and their Google Earth coordinates! See film locations.